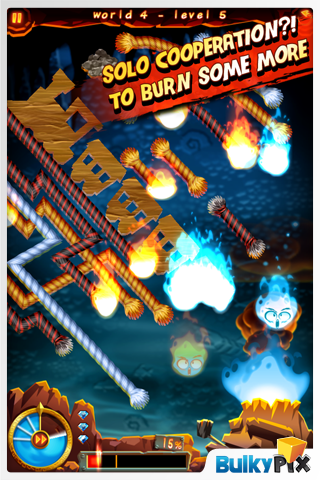 In Burn it All, the upcoming puzzle games from developer Pastagames and publisher BulkyPix (the same duo responsible for Pix’n Love Rush) you must try to set all the ropes and objects on the screen ablaze as quickly as possible by moving your flames around the screen. When I first read the description I must admit that I was initially concerned that this would just be a clone of Big Blue Bubble’s Burn the Rope, fortunately those concerns were quickly put to rest. While the per-level goal of “burn everything in site” is similar, the actual gameplay itself is rather different, as are the game’s control mechanics. The back story is as follows: From the molten depths beneath the Earth’s crust to the Top of the World. Three different little Flames use their unique fiery abilities to burn through all sorts of objects, avoiding water and gas, dealing with underground monsters, blowing things up, and even putting time in a loop to make their way back home, where their father, The Sun, awaits! In popular puzzle game fashion, the game is broken up into 4 worlds containing 25 puzzles each. 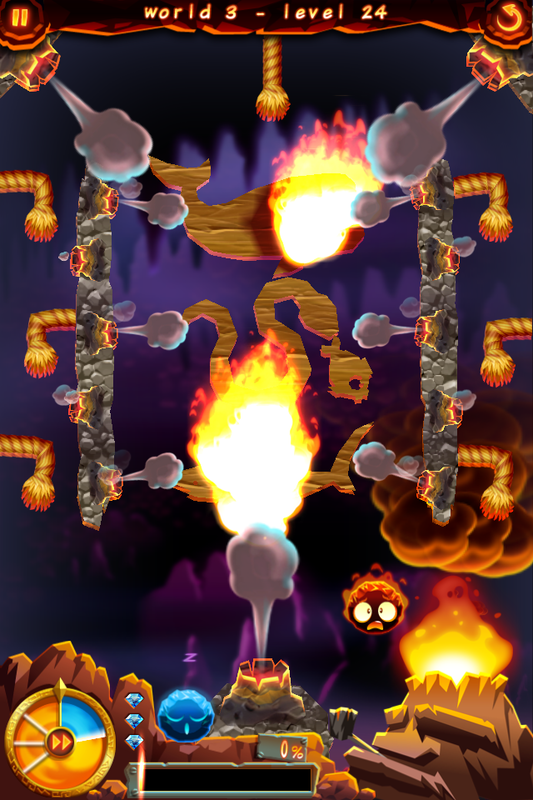 In a level you are presented with one of three different styles of cute little flames, each with their own “Pyro-Powers”. An orange flame can only ignite ropes at their end points, a blue flame can ignite objects from anywhere and finally the green flame can ignite multiple objects at once. You collect your flame with your finger at the bottom of the screen, and drag it to the objects above to start them on fire. Once the flame has been transferred to an object, you must grab a new flame from the bottom of the screen again. While you are doing this, a clock is counting down and if it reaches the end before everything has been reduced to ash, then you fail the level and the next level will remain locked. Upon successful completion of a level you are given a 1 to 3 diamond rating depending on how fast you finished that level. You can actually see these ticking away in the bottom left-hand corner as you progress through the level. This works as a nice motivator and I appreciated the fact that this info is available all the time and you don’t have to complete the level just to see how many diamonds you received. This means that during subsequent attempts (when going for three diamonds), you’ll know exactly when to prematurely restart the level if you are going to only earn two diamonds. Burn it All spans multiple genres and the game is really equal parts puzzle, strategy and arcade games. The key to being successful in not only completing the levels, but earning the sometimes illusive 3 diamond rating on each, is by figuring out the best possible order in which to burn things. Since some types of rope burn faster than others, you may need to make sure these are started first, before moving onto the faster burning ropes. The obstacles, monsters and gas fissures add additional bit of strategy and brain teasing to the game. You’ll also need some fine motor skills and reflexes to weave your flame deftly around falling water droplets, and the ropes and other objects you are not trying not lite up just yet, so you can reach your intended destination. 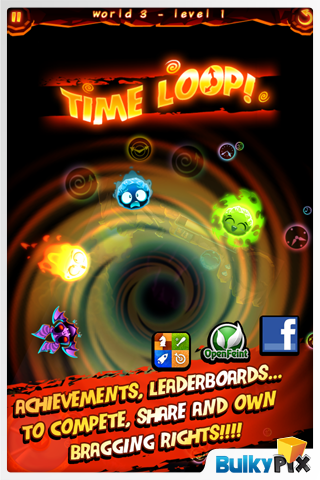 There is a cool “time looping” feature that I will leave as a surprise. The graphics and sound were both excellent, as one would expect from a title coming from Pastagames and BulkyPix. Burn it All easily falls into that same category as other addictive puzzle games like Cut the Rope and Angry Birds with its quick minute or two levels and the ever present allure of 3 “star” (in this case diamonds) completion-ism. In fact, players can show off their pyromaniac exploits via Facebook as well as online leaderboards and over 40 achievements on Openfeint and Game Center. I’d have to say that the one big drawback I had with the game was the sluggishness of the controls. At times I found it to be a bit unresponsive and laggy. The games instructions indicate that you can place your finger anywhere on the screen to move the flame (from there) so you are not blocking things from view. In other words, it doesn’t have to be directly on top of the flame. To be honest, I did not see the appeal of this, for should I start moving the flame from a half inch to the left, then I’m likely to hit the edge of my device’s screen before I am able to move the flame as far left as necessary. So I chose to place my finger directly on top of the flame when moving “him”, and what I found was that often times my finger would get way ahead of the flame and he’d just suddenly stop, or be slowly dragging behind my finger. In a game where a second or two can mean the difference between 1 , 2 or 3 diamonds, this was a fairly BIG source of frustration. I often found myself having to replay levels multiple times to get 3 diamonds, not because I didn’t know what order to ignite the flames, but because I lost precious seconds fighting with the controls. I’m hoping that before the game is released, that some tweaking is done to to improve the 1-to-1 tracking of movement between flame and finger. That being said, when I wasn’t fighting the controls I was definitely having fun. Burn it All is an appealing and creative game which I could easily see it taking off as the next “must have” puzzle game. The game isn’t scheduled to arrive on the App Store until April 28th, but don’t worry, I’ll be sure to remind you here and in my twitter feed.